South Africa is full of astounding natural wonders, and for visitors to the north of the country, the Sudwala Caves are among the most impressive. Carved out of Precambrian rock over 240 million years ago, the cave system is believed to be one of the oldest on Earth. It’s located a 30-minute drive from the city of Nelspruit, and has earned a reputation as one of the most popular tourist destinations in Mpumalanga Province. 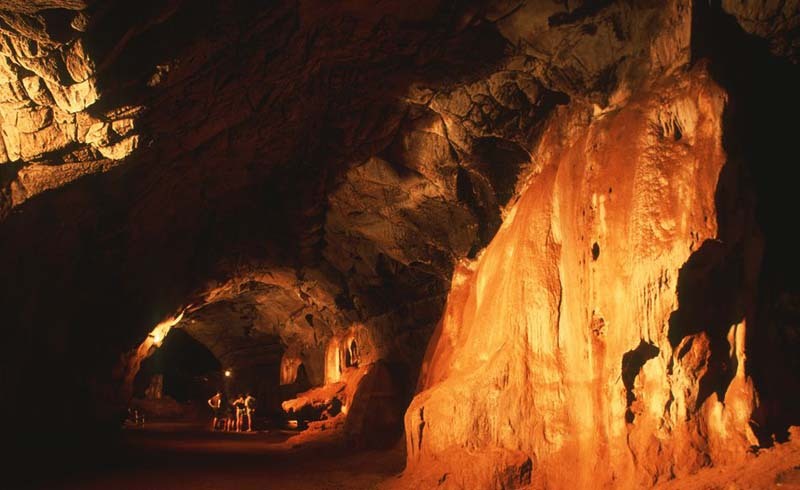 The Sudwala Caves are carved from the Malmani Dolomite Ridge, which is in turn part of the famous Drakensberg escarpment. The ridge itself dates back to the earliest era of the Earth’s history - the Precambrian period. This makes the rocks that surround the caves approximately 3,000 million years old; although the caves themselves first began to form much later (around 240 million years ago). To put that in context, the cave system dates back to a time when the planet consisted of two super-continents—making Sudwala older than Africa itself. The cave system exhibits typical Karst topography, which gives us a clue as to how it was formed. Over hundreds of thousands of years, carbon dioxide-rich rainwater filtered through the porous rock of the Malmani Dolomite Ridge, becoming increasingly acidic on its way. It gradually dissolved the calcium carbonate in the dolomite, collecting along natural fissures and fractures and expanding them over time. Eventually, these weaknesses in the rock became caves and caverns, which ultimately connected with one another to form the system as we know it today. Initially, the caves were full of water, which dripped from the ceilings to create fantastical rock formations known as stalactites, stalagmites, columns and pillars. Archaeological excavations show that the Sudwala Caves were once inhabited by prehistoric man. Stone Age tools on display at the entrance to the caves date from approximately 2.5 million years ago to a few thousand years BC. More recently, the caves provided refuge for a Swazi prince called Somquba. Somquba was forced to flee from Swaziland in the second half of the 19th century, after a failed attempt to seize the throne from his brother Mswati. However, the exiled prince continued to lead his men over the border to conduct raids and steal cattle; and when he returned to South Africa, the loot from these forays was kept at Sudwala. Somquba and his soldiers also used the caves as a fortress, perhaps because of its abundant water and the fact that it was so easy to defend. The caves are named after Somquba’s chief councillor and captain, Sudwala, who was often left in charge of the fortress. Local legend has it that Sudwala’s ghost still haunts the cave system today. This is not the only rumor surrounding the caves. During the Second Boer War, a vast hoard of gold bullion belonging to the Transvaal Republic disappeared while being transported to a town in Mpumalanga for safekeeping. Many believe that the gold was hidden in the Sudwala Caves—although numerous attempts to find the treasure have so far been unsuccessful. 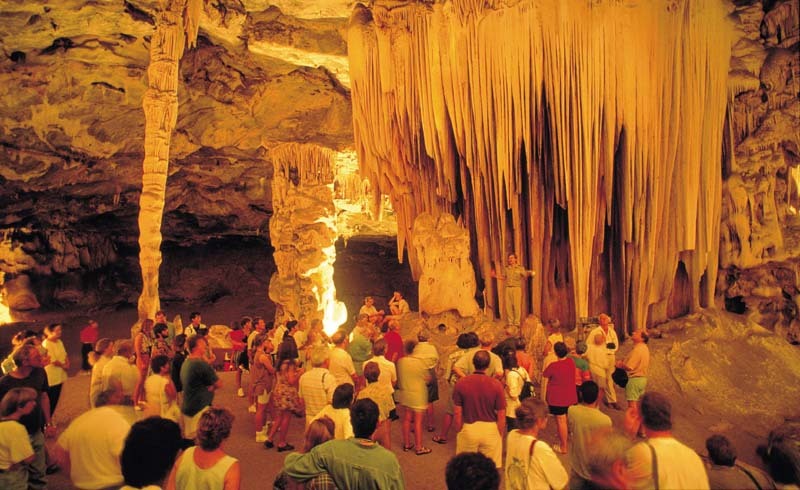 In 1965, the caves were purchased by Philippus Rudolf Owen of Pretoria, who subsequently opened them to the public. Today, visitors can learn about their incredible geological and human history on a one-hour guided tour, which takes you 600 meters into the cave system and approximately 150 meters below the Earth’s surface. The walkways are beautifully lit by colored lights that highlight the caves’ most interesting features and formations. Tours are scheduled regularly, with a maximum wait of 15 minutes upon arrival. The more adventurous may want to sign up for the Crystal Tour, which takes place on the first Saturday of every month. It takes you 2,000 meters into the depths of the cave system, to a chamber that sparkles with thousands of aragonite crystals. It’s not for the faint-hearted, however. The route involves intense spelunking through waist-deep water and tunnels just big enough to crawl through. Age and weight limits apply, and the tour is unsuitable for claustrophobics and those with back or knee problems. The Crystal Tour must be booked several weeks in advance. The main highlight of a visit to the Sudwala Caves is the Amphitheatre, an incredible chamber at the heart of the complex that measures 70 meters in diameter and ascends 37 meters towards a beautiful domed ceiling. Other notable formations include Samson’s Pillar, the Screaming Monster and the Rocket, the oldest of which has been formally dated at 200 million years old. As you wander through the caves, keep an eye out for the fossils of a primitive plant genus known as Collenia. The ceilings are also home to a colony of over 800 insectivorous horseshoe bats. While waiting for your tour to begin, make sure to check out the prehistoric artefacts displayed at the entrance. Afterwards, continue your adventure with a visit to the on-site Fish Spa, or a tour of the Sudwala Dinosaur Park. This popular attraction is located 100 meters away and features life-sized models of prehistoric animals and dinosaurs set within a beautiful tropical garden. You can also spot monkeys and exotic birds living freely within the park, while a display of live Nile crocodiles celebrates the reptiles’ ancient ancestry. The Crystal Tour is priced at R450 per person, and requires an advance deposit of R200. If you want to take the tour but won’t be in the area on the first Saturday of the month, it’s possible to arrange a separate tour at a time of your choosing for groups of five or more. For overnight stays, recommended accommodation options include Sudwala Lodge and Pierre’s Mountain Inn. The former is located a five-minute drive from the caves, and offers a selection of family-friendly rooms and self-catering chalets set within a scenic garden complete with a swimming pool. The latter provides 3-star en suite rooms and a restaurant within walking distance of the caves' entrance.